Scientists accurately map the shape of the bedrock beneath a glacier using a new technique. The land surface under a glacier is sculpted and shaped by the ice passing over it. Data about the shape of the bedrock yield information crucial to understanding erosional processes underneath a glacier. However, the inaccessibility of sites where glacial erosion currently occurs presents big challenges for advancing this understanding. A range of techniques has been used to map the bedrock beneath glaciers, including drilling, seismic surveys, multibeam bathymetry, gravity measurements, and radio-echo soundings. The accuracy of results has been limited, so Nishiyama et al. tested a different technique: emulsion film muon radiography. 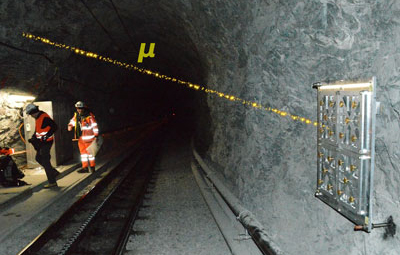 A muon detector in the Jungfrau railway tunnel awaiting arrival of the cosmic ray muons. Credit: Nishiyama et al. Muons are formed when cosmic rays collide with atoms in Earth’s upper atmosphere. They descend toward Earth, with about 10,000 muons reaching each square meter of Earth’s surface every minute. One of their significant properties is that they can pass through matter, even dense and solid objects on Earth. Particle detectors can be used to measure the quantity of muons and their trajectories, which can reveal information about the materials that they have passed through. Because cosmic muons travel only downward, detectors need to be located below the objects to be surveyed. This technique has been used by geophysicists to scan the interior architecture of volcanoes, seismic faults, and caves and to detect carbon leaks, but it has posed a challenge for surveying the bedrock beneath glaciers. The team of researchers found a solution in the central Swiss Alps: the Jungfrau railway tunnel, which runs through the bedrock beneath the Aletsch glacier. They set up three particle detectors in the tunnel that are oriented upward with a view of the bedrock beneath the base of the largest glacier of Europe. Different types of particle detectors are available for muon radiography, but the team selected emulsion films, a special type of photographic film that can be used in remote and harsh environments because it does not require any electric power or computers for operation. Because of the density contrast between ice and rock, the patterns of muons captured on the film over a 47-day period could be used to accurately map the shape of the bedrock below the glacier. Using this technique, the researchers were able to map the bedrock-ice interface beneath the glacier over a 4000-square-meter area. They were also able to infer the glacier’s response to global warming. 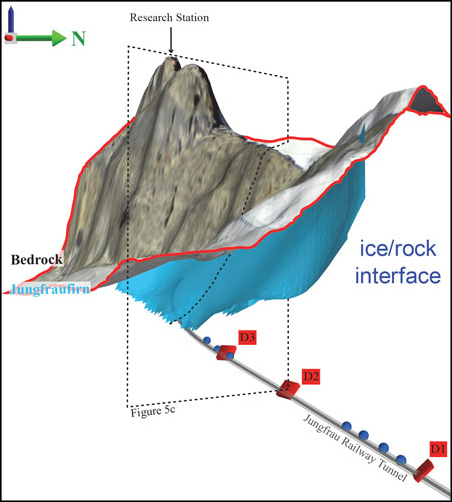 In particular, the team predicts a larger frequency of rock avalanches as the ice shrinks, exacerbated by reconstructed bedrock geometry beneath the glacier. This increase is of particular concern because buildings are situated on top of the bedrock. These include tourist facilities, a research station, and communications infrastructure, as well as the railway tunnel itself, which cuts through the bedrock. Citation: Lunn, J. (2017), Cosmic muons reveal the land hidden under ice, Eos, 98, https://doi.org/10.1029/2017EO074207. Published on 23 May 2017.